To make the caramel: Preheat the oven to 350°F. In a small saucepan, bring 1/2 cup stevia and water to a boil. Whisk until all sugar dissolves completely. Reduce heat to medium-high and cook sugar mixture until golden brown in color, about 5 minutes. Pour into 8 6-oz ramekins, tilting to evenly coat bottom of ramekins; set aside. 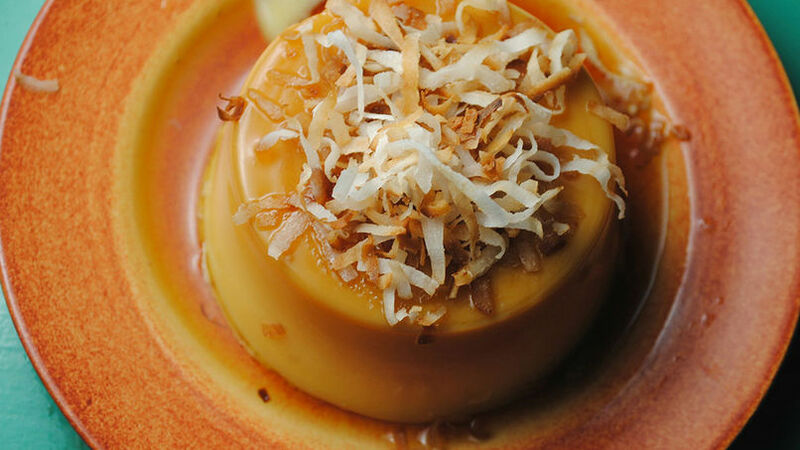 To make the flan: In a saucepan, bring coconut milk and milk to a simmer over medium heat. Beat eggs, egg yolks and 1/3 cup stevia until foamy and light. Carefully add simmered milks to the egg mix and add the vanilla extract; beat until well-blended. Ladle mixture into ramekins, place ramekins in a large roasting pan and add 1 inch of water to pan. Bake for 25-30 minutes or until a toothpick inserted in the flan comes out clean. Remove pan from oven, carefully remove ramekins and chill for at least 3 hours. When ready to serve, to unmold, run a knife around edges of the ramekins to loosen the flan and turn upside down onto a small plate. Serve garnished with toasted coconut. For garnish: Preheat oven to 300°F. Place shredded coconut on a baking sheet and toast for 5-8 minutes, until golden, stirring occasionally. Toast the coconut after you remove flans from oven, place in a plastic bag and you'll be set and ready to go when it's time to serve. A holiday sweet treat, this luscious flan is made with sugar substitute; using stevia, anyone can enjoy the flavor of this Latin dessert!